The pattern is in English and includes both written instructions and pictures to help walk you through the process. It’s a pretty simple amigurumi, but is designed for intermediate level crocheters (those with a bit of crochet experience) since it does use techniques like the magic circle. 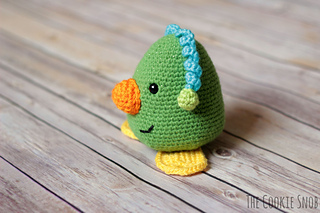 This pattern also includes a step-by-step photo-tutorial on the invisible decrease to help make your amigurumi neater. Most of this pattern is worked in the round, meaning it’s worked in a continuous spiral without joining. 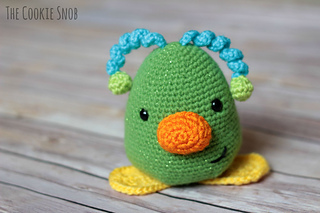 You can customize this pattern by using any color or weight of yarn that you’d like to use, since gauge doesn’t matter as long as you’re consistent. Just be sure to adjust your hook size as needed to make sure that your stitches are tight enough to keep the stuffing in. I recommend using worsted weight yarn and a size F (3.75 mm) crochet hook. You will also need safety eyes (10 mm) and a tapestry needle. I made mine with an assortment of worsted weight yarns: Red Heart Shimmer in Lime for the body (about 60 yds), and a small amunt of Crafter’s Secret in Orange for the nose, I Love This Yarn in Yellow for the feet, Red Heart Super Saver in Turqua for the antennae stalks and Vanna’s Choice in Lime for the antennae ends. I also used a tiny amount of black yarn to stitch on the mouth. As you can see, this is a great way to use up your yarn scraps. If you have any difficulties with the pattern, please contact me and I’ll do my best to help you out!